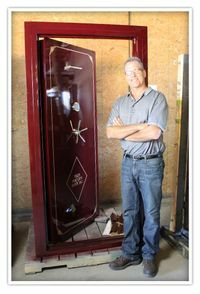 Since 1982, at Smith Security Safes, we take pride in our USA made safes and vault doors. 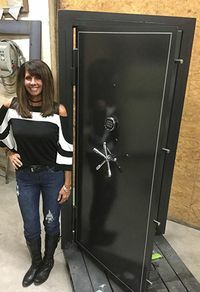 We have the experience to help you design your custom vault room and install your custom or stock vault door in your home, in addition to the several standard sizes available. We want your experience of purchasing a safe or vault door with us to be as effortless as possible. 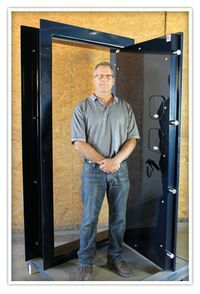 We cater to both residential and commercial safe and vault door customers. Which Vault Door is Right for Me? At Smith Security Safes we are available to answer your vault door and safe questions five days a week. With so many installation and state specific building code variables it is impossible to answer questions thoroughly in copy, please call and we can quickly answer your questions over the phone. How thick should the wall to your vault room be? Is it ok to use concrete block over poured concrete walls? How to use stainless steel to stop cutting torches ? Air ducts, yes or no? Moisture problems and what to expect? Why you should use a cutting wheel relocker? Doug, the owner, will answer the phone! 800-521-0335 • Call for hassle free answers! What do I need to know to design a vault room? What size room will work best? How to create a concrete ceiling? How do I create a secure wood framed wall on a budget? How to create a room beneath a porch or patio? Why two pieces of steel with plywood in between is better than one piece of thick steel? Should I go with an in swing door? 3/16”-1/4”-3/8” – ½” or 1” of solid steel plate No composted doors. Also can be made of Solid Stainless Steel. Chrome or Gold. Standard combination. Digital. Digital with a duress option. Bio metric (fingerprint). Standard Lever. 5 Spoke - Chrome, Black Chrome or Gold. USA Solid Brass. Made from 2”,4”,6” or 8” Channel for the lighter doors. Made from formed Channel iron for the Magnum Series up to 24”. 13/16” for the lighter doors. 1 ½” Stainless Steel for the Magnum series. Will stop Cutting Torches and Cutting wheels from breaking in though the lock. We add extra steel to the inside of the door to stop cutting torches from cutting though the door. This is a special 5” long unpickable key that can unlock your door in case of Vandalism, fire or a malfunction. Made from hardened tooled steel. 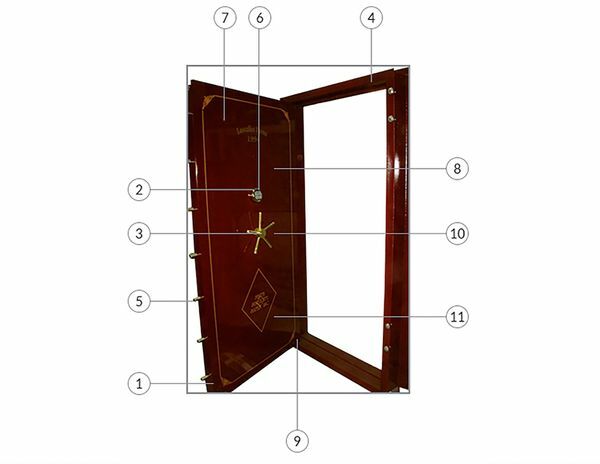 Designed so your door can swing a full 180 degrees. Also, the door can be lifted from off the frame. We use a ½” thick piece of Manganese and that will stop any drill bit. 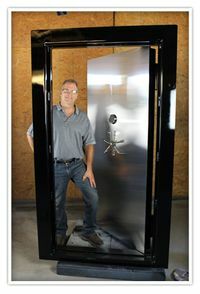 "I cannot say enough great things about my Magnum Extreme door by Smith Security Safes! Before the purchase, Doug answered all my questions and there were many of them. The purchase and delivery was smooth and fast, especially for such a large and heavy item. The installation was exactly how described and the door quality exceeds expectations. The door is perfectly balanced! It can be moved with one finger even though it weighs 10x more than I do. Doug has been great to work with before, during and after the purchase. 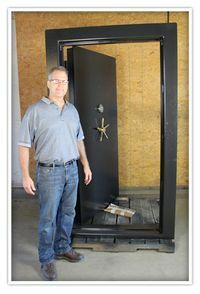 I highly recommend Smith Security Safes and I will be a returning customer when I build my next vault." "I just wanted to send you a quick note to tell you how pleased I am with the heavy duty door. Your guys were great helping load it into my truck and the main thing…….QUALITY. Quality construction, quality operation, quality appearance and quality personnel. It's refreshing to see it still exists. You're a blessed business man." 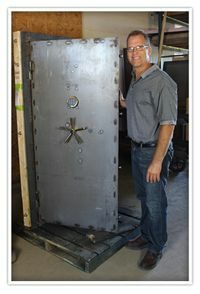 "Just a quick note that my magnum vault door is installed and fits perfectly. Installation was super easy (considering it weighs 1000 lbs!) and everything works great. I appreciate your working with me to design this custom size door. I will gladly recommend Smith Security Safes to anyone looking for an affordable solid door or safe with great customer service." 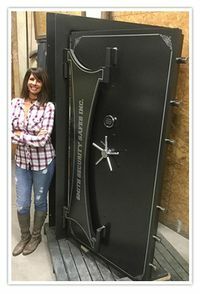 "I have been wanting to take the time to let you know how extremely happy we are with the vault door! We just love it! Thanks again for a GREAT door!"